Used for neutralising systemic envenoming by members of the Australian tiger snake group and also copperheads, the rough scaled snake, the broad-headed snake, the pale-headed snake, Stephen's banded snake and many members of the black snake group (but not the mulga or king brown snake or Collett's snake). It is also effective against many sea snake bites. It is made from horse IgG. Each ampoule contains 3000 units of neutralising capacity against the target venoms. Average volume per ampoule is 9-12mL. The immunising venom is common tiger snake venom. Tiger snakes are a common cause of snakebites and the second most common cause of snakebite deaths in Australia. Adult fangs in the common tiger snake are about 3.5mm long. They produce a moderate amount of very toxic venom. They vary in length up to 1.5m, though some sub species of black tiger snake may exceed 2m, with correspondingly longer fangs and more venom. Coloration for the common (mainland) species is variable, though most specimens show banding. However, unbanded brown or black colour phases are seen. The black tiger snake is usually coloured as its name suggests, though juveniles may show faint banding. The common copperhead is similar in size to the common tiger snake, but has a russet sheen on the sides of the body and is not banded. There are typical pale cream or white edging to the scales of the upper and lower lips in all copperheads, a useful diagnostic feature. The highland copperhead is similar to the common copperhead, though generally smaller. The pygmy copperhead is smaller and grey in colour. 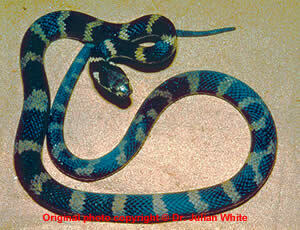 The rough scaled snake, also known as the Clarence River tiger snake, is up to 1.2m long, with banding on the body. The broad-headed snake, pale-headed snake and Stephen's banded snake, all of the genus Hoplocephalus, are generally nocturnal, and small in size. Colouration depends on species. The black snakes are also mentioned under the section on black snake antivenom, although CSL Tiger Snake Antivenom is often the preferred choice for treatment. Two of the species recognised in Australia; the red bellied black snake, a uniformly black coloured snake with a deep red belly; and the blue bellied or spotted black snake, with a black or dark grey-brown body with black specks and a dark to black belly, respond to CSL Tiger Snake Antivenom. Note that there are three other members of this genus in Australia, the mulga snake (king brown), Butler's mulga snake and Collett's snake. The former two are large brown coloured snakes from arid Australia, which respond best to CSL Black Snake Antivenom and are discussed in detail in the section on that antivenom, along with Collett's snake. Tiger snakes are moderately common in wetter areas of southern and coastal eastern Australia, particularly near water courses or swamps. The copperheads are also found in wetter areas of south eastern Australia. The rough scaled snake is found in wetter areas in selected parts of eastern Australia. The broad-headed snake is increasingly rare, confined to rocky areas of parts of the great Divide, NSW. The pale-headed and Stephen's banded snakes have a wider range in NE NSW, through to SE Queensland. The Black snakes are found in a variety of habitats in eastern Australia. The commonest species, the red bellied black snake prefers wetter areas, often near water. 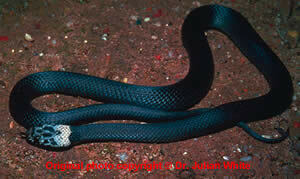 The blue bellied black snake is more common in dryer habitats, notably in rocky areas. 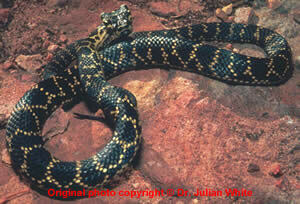 Tiger snake venom is very potent and contains neurotoxins, both pre and post-synaptic, myolysins, and procoagulants. Kidney damage may occur, but is probably a secondary phenomenon. Copperhead venom is less well characterised but contains neurotoxins and may cause myolysis. Coagulopathy is less certain. Rough scaled snake venom has effects very similar to those of tiger snake venom. Broad-headed snakes, pale-headed snakes and Stephen's banded snake venom contain a procoagulant, but not neurotoxins or myolysins of clinical significance. Black snake venoms are less toxic and do not contain major neurotoxins, myolysins or procoagulants, though minor myolysis may occur. Prior to the development of antivenom, nearly 50% of all tiger snake bites were fatal. This snake is still an important cause of snakebite deaths. Unlike brown snake bites, most tiger snake bites will result in systemic envenoming, so most patients will need antivenom therapy. A typical tiger snake bite is felt, is locally painful and often there is local redness, swelling, and bruising at the bite site. Occasionally there is a small area of skin damage. Fang puncture or scratch marks are usually visible to the naked eye. The venom will cause the usual features of systemic envenoming, such as headache, nausea/vomiting, abdominal pain and sometimes collapse. In children early collapse and grand mal convulsions may occur. Draining lymph nodes may be tender. Paralysis is a common feature of tiger snake bites. The earliest sign is usually ptosis, which develops from 1 to several hours after the bite. It may be followed by progressive paralysis of ocular, facial, peripheral and glossopharyngeal muscles, the latter imperilling the airway. Full paralysis of respiratory muscles may eventually develop, if no antivenom is given. Presynaptic paralysis by this venom is not reversed by antivenom, therefore it is essential that early signs of paralysis be noted and antivenom given then, prior to development of major paralysis. If the patient presents many hours after the bite, with major paralysis requiring intubation and ventilation, it may be necessary to continue this for days, weeks, very occasionally even over a month! Severe myolysis can occur with tiger snake bites, particularly if treatment is delayed or inadequate. The usual signs may occur, including muscle weakness and movement pain, myoglobinuria (red/brown urine that looks like haematuria and tests positive for blood) and later development of muscle wasting. Secondary kidney failure may occur, as may severe hyperkalaemia, a potentially fatal complication requiring heroic measures, including dialysis. Defibrination coagulopathy is a common feature of tiger snake bites, may be profound as with brown snake bites, and lethal cerebral haemorrhages have occurred. However, unlike brown snake bite defibrination, which is slow to resolve without antivenom therapy, tiger snake bite defibrination often completely resolves spontaneously after 15 to 18 hours, even without antivenom therapy. Thus a tiger snake bite seen very late may have apparently normal clotting, but degradation products will still be raised, as evidence of the earlier oagulopathy. Given the danger of major haemorrhage, letting the coagulopathy resolve spontaneously is definitely not a clinical option, and it should be treated, if present, with antivenom. Usually at least 3-4 vials of CSL Tiger Snake Antivenom will be needed. FFP is generally not needed and should not be used if there is still circulating venom, except if there is major, life threatening haemorrhage. Kidney damage does occur, though less commonly than with brown snake bites, and causation is multifactorial, due to secondary factors such as myolysis and coagulopathy. Copperhead bites are only infrequently reported and there is a paucity of good clinical data. From available information it appears that the common copperhead can cause severe envenoming, with paralysis and possibly myolysis, but defibrination type coagulopathy is unlikely, though secondary kidney damage might occur. Bites are likely to cause local pain and swelling. Bites by the highland copperhead are likely to be similar to those of the common copperhead. For the pygmy copperhead in SA, all bites so far recorded have been minor, with minimal local pain or swelling and no significant systemic effects. However, this does not imply that every bite will be minor. Bites by the broad-headed snake, pale-headed snake and Stephen's banded snake can cause severe defibrination coagulopathy, but not paralysis or myolysis. Clinically they behave similarly to brown snake bites, with which they may be confused. Rough scaled snake bites can be severe, with local pain and swelling, paralysis, myolysis, defibrination coagulopathy and secondary kidney damage. Bites by black snakes are rarely life threatening and do not cause paralysis, defibrination coagulopathy or major myolysis. They are discussed in more detail below, in indications for antivenom use. As with most antivenoms, CSL Tiger Snake Antivenom should only be given if there is clear evidence of envenoming. See potential contraindications. It should be given intravenously, through a drip set. If possible, dilute antivenom up to 1 in 10, with an isotonic crystaloid solution (eg saline, Hartmans or dextrose). In general, each ampoule/dose should be run over 15-30 minutes. Prior to commencing antivenom therapy, make sure everything is ready to treat anaphylaxis, should this occur. Specifically, have adrenaline ready to give. If there is an infusion pump available, have this set up to run through a side arm of the drip set, with a solution of dilute adrenaline (eg 6mg adrenaline in 100mL of saline or 5% dextrose, or equivalent dilution). Clearly mark this pump, so that it is not accidentally started. The use of adrenaline as pre-treatment when using antivenoms is still being debated. The risk of anaphylaxis varies from antivenom to antivenom. People who have had previous exposure to equine derived products may be at greater risk. It is recommended that the Product Information be read before use and if necessary contact be made with a specialist in the field. For tiger snake bites, the majority of patients will need antivenom. Any evidence of paralysis, myolysis, coagulopathy or kidney damage, or clear general symptoms of envenoming, such as vomiting or collapse, mandate the early use of antivenom. Start with at least 2 vials of CSL Tiger Snake Antivenom, or 4 if there is coagulopathy, severe paralysis, a multiple bite or the bite was by one of the larger subspecies of black tiger snake. Be prepared to give further doses to reverse the coagulopathy, or reduce the degree of severe myolysis. The extent and resolution of coagulopathy can be used to guide antivenom dosage. For copperhead bites, the proportion of bites requiring antivenom therapy is less certain. For bites by the common copperhead and highland copperhead, it may be similar to tiger snake bites, but for the pygmy copperhead in SA, very few bites will require antivenom therapy (in fact no confirmed cases so far). For the common copperhead and highland copperhead, start with at least 1 vial of CSL Tiger Snake Antivenom, but use more than 2-4 vials if it is a multiple bite or the patient is already severely envenomed. As coagulopathy is probably not a major feature of bites by this snake, its extent and resolution cannot be used to guide antivenom dosage. For rough scaled snake bites follow the guidelines for tiger snake bites, which are very similar in clinical effects. The extent and resolution of coagulopathy can be used to guide antivenom dosage. For bites by the broad-headed snake, pale-headed snake and Stephen's banded snake, antivenom is required if there is a coagulopathy, probably present in at least 50% of bites. Start with 2-4 vials, however further doses may be required to reverse severe defibrination. For bites by the red bellied black snake and the blue bellied black snake (=spotted black snake), antivenom is often less important, as these bites are rarely life threatening, though they may be distressing for the patient. Certainly, only cases with major systemic envenoming should be considered for antivenom therapy. As paralysis and coagulopathy do not occur, they cannot be used as criteria of envenoming. Myolysis, if present at all, is generally very mild, with peak CK of <2000IU. This does not, by itself, warrant antivenom therapy. If the patient is a young child or elderly or infirm, then antivenom therapy should be considered more actively. Apart from these patients, in ormal healthy adults, antivenom is best reserved for severe envenoming with recurrent vomiting, major abdominal pain or headache, or where there are other significant symptoms or signs. Transient headache, vomiting or abdominal pain are not sufficient to commence antivenom therapy following bites by these snakes. If antivenom is to be used, CSL Tiger Snake Antivenom is effective and is preferred to CSL Black Snake Antivenom for two reasons; it is lower volume, therefore safer, and it is cheaper. One vial will often be sufficient, though occasionally 2 or more vials are needed to resolve all symptoms. Any patient who has received antivenom may develop serum sickness, from 4 to 14 days later. Before leaving hospital, they should be advised of the symptoms of serum sickness, such as rash, fever, joint aches and pains, malaise, and told to return immediately for review and probable commencement of oral steroid therapy. If there was major envenoming, organise follow up. This is usually not necessary for minor envenoming. If several bottles of antivenom have been given to the patient (eg. >4) it may be useful to give a 5 day course of oral steroids as prophylaxis for serum sickness (eg 30-50mg daily of prednisolone, for adults).